Entries are due a few weeks prior to each Camp Date. But, don't wait...limited space is available! Summer Day Camp is so much fun! Campers will be given a 1 hour riding lesson each day. Also, campers will be taught various horse management skills, such as safety around horses, grooming, tacking up, parts of the horse, parts of the saddle/bridle, horse health, how to bath a horse etc... There will also be fun arts & crafts each day. Helmets are required, and are provided. At the end of Camp, each Camper will receive a picture of them with their horse. Campers must wear boots (no tennis shoes or crocs) and long pants (jeans or breeches are recommended. NO SHORTS). If your child shows up in shorts, they will not be able to participate in their riding lesson that day. Also, please note that ANYONE entering the barn must have proper footwear (this means parents/siblings/grandparents/etc...). No sandals or crocs allowed in the barn. This is for your own safety. Also, due to insurance we are unable to take children with special needs. There are several barns in the area that we can recommend, which are able to accommodate children with special needs. Any questions? 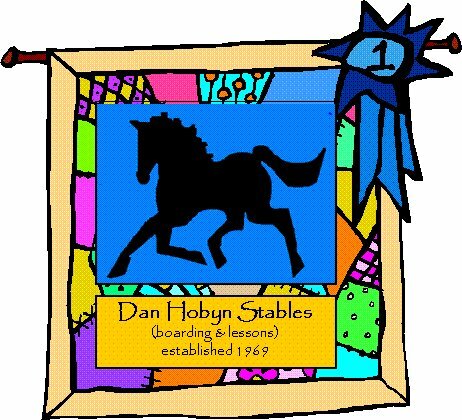 Email us at danhobynstables@aol.com.